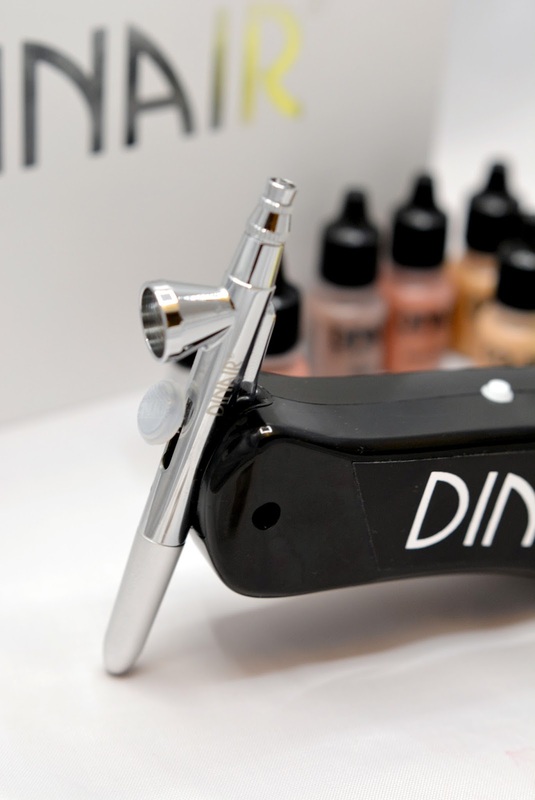 Dinair AirStyle is the first all-in-one, hand-held rechargeable applicator to feature an actual airbrush. 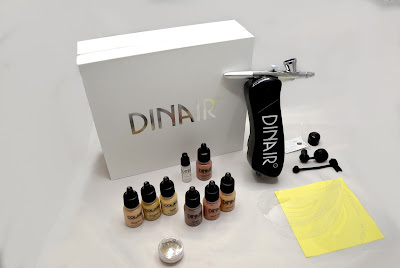 The device debuted on the market at the end of 2017, and is now available on Dinair's webiste within a kit bundle or just by itself . The AirStyle was conceived to allow Dinair users to apply makeup with total freedom, regardless of the location and independent form a power supply. As you can see from the images, it basically consists of a handle with an airbrush on top, and there is no air hose or power cord to stand in the way. The "handle", which houses the micro compressor, features an off/on button and a charging port at the bottom where you can plug in the charging cable, which features USB connectivity. According to the instructions the unit charges fully in about an hour, and a single charge provides over a half hour of continuous use. This means that if you remember to switch it off when you are not spraying (for example when you are loading colors) a single charge may last you up to five days for personal use. The airbrush on top is just 5'' (12 cm) long, and is a continuous airflow model with a classic screw-on nozzle wide enough for all of Dinair's colors and lines. The strength of the airflow is proportionately adequate, and while I have no way to measure it exactly I would estimate it at a good 10 PSI. The pressure output is not adjustable and remains constant throughout the battery life, and the unit simply stops working when the charge has run out. It will of course work while it is plugged in, so if users miscalculate the time left on the charge all they will have to do is find an outlet to finish their application. The AirStyle is not a very quiet system. It produces a level of noise comparable to that of an average hair dryer. Not a major issue, but one to keep in mind if you wish to use it in the same room with someone who is sleeping. The Airstyle Kit comes with the unit itself housed in a sleek white box with a molded velveteen tray inside, an elegant packaging solution reminiscent of Apple's devices. There is also a small clear pouch filled with goodies that are selectable from the options listed on the website page. You will get three foundation colors in your chosen color range and in your preferred line (Glamour, Soft Glow or Radiance are the options that Dinair offers based on their finish, please see this article for full explanation). You also get a blush, a highlighter and an eyebrow color, automatically selected to complement your choice of shade range, and of course you will be able to use these colors also as eye shadows. Also present is an eyebrow stencil set, a bottle of practice color for your exercises on paper (sheets are provided along with an operating instruction sheet), a sample of post-application moisturizer Moist and Dewy and one of cream concealer. Finally, a bottle of Dinair cleaner and a set of cleaning caps, with a bonus anti-spill cap. 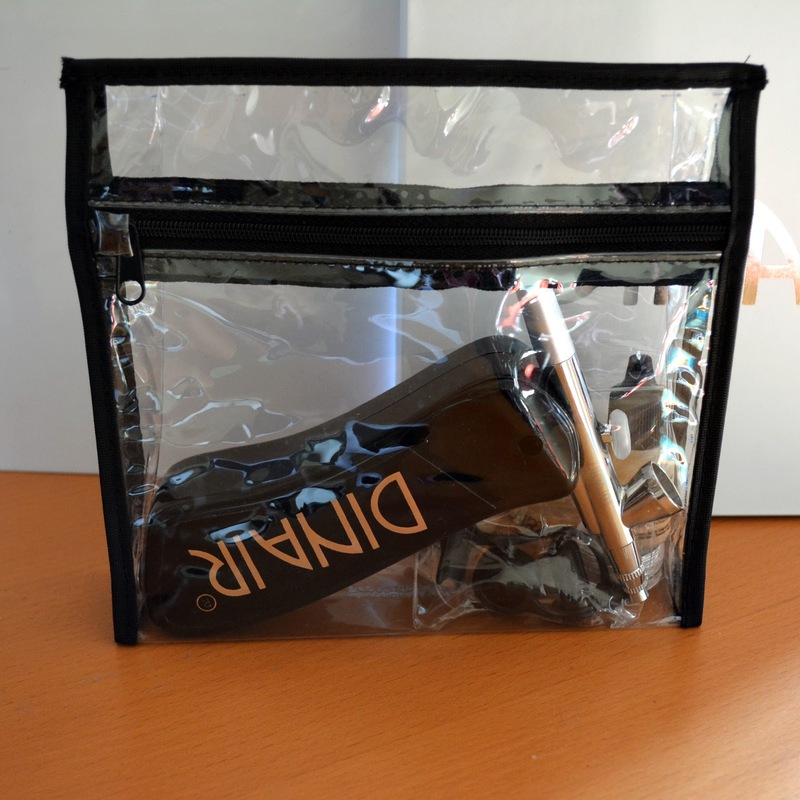 The small clear pouch housing these products is also the ideal size for your AirStyle. While it offers no shock protection, it is perfect for carrying the device and the few products you might need when going outside, which is what the kit is intended for in the first place. The Dinair Airstyle is intended explicitly and solely for Dinair product users. You will NOT be able to run products by other brands, at least not comfortably and without major clogs, as the nozzle size and pressure output are designed exclusively to run with Dinair lines. This might sound strange to professionals who are used to thinking, as I do, that after all "an air source is an air source and an airbrush is an airbrush", but trust me, in this case the caveat does apply. A very good ally in using the product smoothly will be found in the Cleaning Cap system, which is included in the kit. The cleaning system works and works well, and it is crucial for optimal performance. I have been using the AirStyle system for a while now and I have to say it gets easier every time. Please view the video below to see it in action as I conceal prominent rosacea spots on a model. The ergonomics of the design may require a little getting used to if you are used to traditional airbrushes, but the commodity of being unencumbered by cords and hoses makes me reach for it much more often than I expected for personal use. 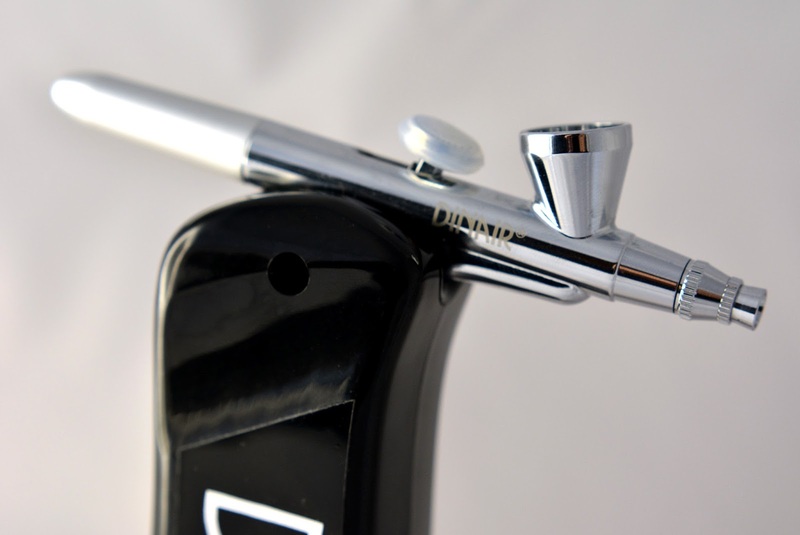 On a technical level I find the idea of a a truly hand-held, cable and hose free compressor with a real, full-fledged airbrush nothing short of genius, and I highly commend George Lampman (Dinair's CEO and co-founder) for this remarkable innovation. I think personal users will find the AirStyle to be a very interesting alternative to their table top system for all those occasions when mobility and speed are important. I do wish it came with a CX airbrush on top instead of the current one, because that is a superior quality airbrush and an easier one to maintain and deep clean. I also hope that future versions will feature charge indicator lights, a stand or base that would allow me to keep it on my desk upright, and a reduced noise output. On a professional level I think the AirStyle has an enormous innovation potential. 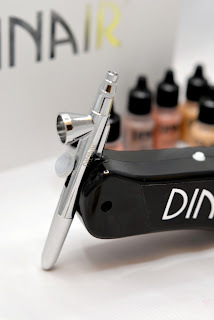 With the addition of a few features such as a selectable pressure output and a quick-connect adapter (to allow you to connect any compatible airbrush), this tool would represent a total game changer not only the airbrush makeup industry, where everyone would want one, but I suspect for airbrushing as a whole. I was fortunate enough to meet George Lampman, and I wouldn't be in the least surprised if he came up with exactly that product in the future. Great and fair review. I have always loved Dinair makeup and have every unit but this one. I didn't buy it simply because it was too loud and I didn't like not being able to remove the airbrush. To your point George is quite the innovator so I am waiting for the next version to come out.